Diplomatic plots in Abuje, Nigeria. Mis(sing) Representation was taken in 2008 in what is known as Diplomatic Drive. I had walked up and down the drive from hotel Bolingo to the United Nations headquarters for 5 days, working for the UN but with not much to do apart from walking up and down the drive. That was before the UN building was bombed by Boko Haram killing 21 people. And before the American embassy put up their forward defence and blocked the road to pedestrians without a cause. 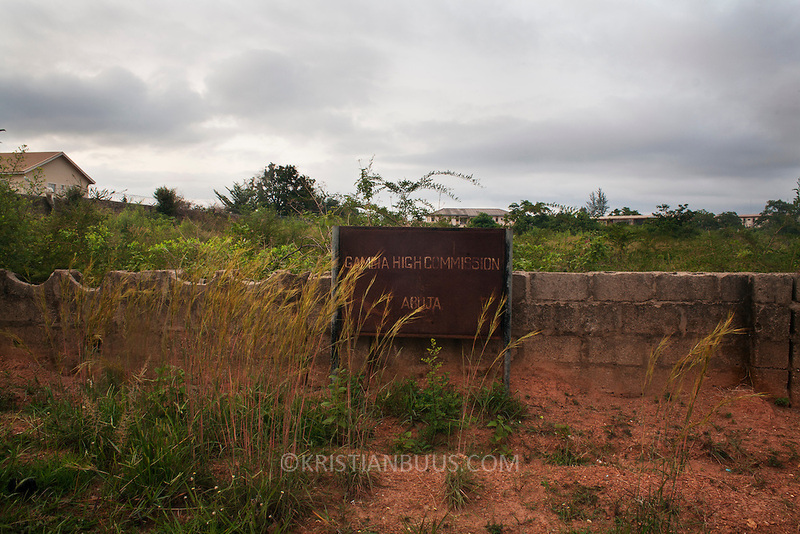 I was back in Abuja in 2012 and as far as I could get to see some of the plots are still overgrown land - others do have buildings erected, but most still not quite there. However, a stocky CIA guy stopped me from revisiting most of the depicted sites stating national security was at stake.Abuja, the capital of Nigeria, was officially inaugurated in December 1991 and is placed bang in the middle of the country. Lagos is still the financial hub of the nation but most admin has been moved to the relatively new-built city. Diplomatic Drive was designed with the UN HQ at the dead-end of the road and with embassies all along the wayside. With usual Nigerian beaurocratic effiency all of the plots of land along the road were allocated to various nations and in 2008 most of these plots still lie empty. Did they by default constitute foreign land and by that command diplomatic status? Could one ask for political asylum stepping into these bushy bits of overgrown scrubland? Would one need a passport to cross? No-one seemed to know but nobody ever squatted the land or ventured in to cut through to the neighboring bustling streets.